I'm so excited to be able to announce that Chasing Aledwen is now available in Audio! Listening to Aledwen was amazing! Hollie did such a great job at the voice! No one said being a Princess was easy, and for Aledwen, the Fae Princess of Spring, it's even harder. With the Birth of Spring approaching, and her time running out, she has to find a way of unlocking her magic and performing the ceremony. Luckily for her, she has her mates to support her. Even if her shifters seem like nothing but trouble, and her elf's sense of duty could keep them apart. Can Aledwen become the Queen she was always meant to be? Or will she be stuck as a magicless Princess. 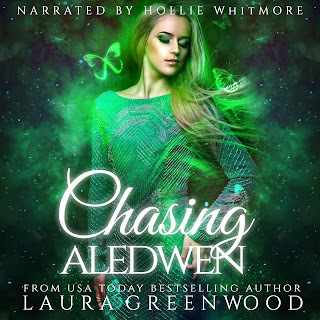 Chasing Aledwen is a Reverse Harem set in the Paranormal Council Universe, and is the first book in the Fated Seasons: Spring series.